The £200 challenge… A full DSLR kit for a range of situations, for the same cost as a bridge camera? I looked at him a blankly and was initially very unhelpful. Not deliberately, mind you. It’s just that there are so many different types of camera out there, with different advantages and disadvantages, prices and sizes. After a few minutes I managed to ask him what sort of photos he wanted to take, and what he wanted his camera for. Now, I love a challenge, and I got to thinking about what sort of cameras you can use for everything – or at least what sort of camera you can use in the majority of situations. Obviously, budget has to be a consideration, so I asked him how much money he had to spend, and he decided that about £200 was a good figure to settle on. To a lot of people (me included!) £200 is a lot of money to lay out in one go, and a lot of people would never dream of spending so much on a camera (me not included). But as high-end professional cameras can be in the tens of thousands of pounds, clearly some compromises need to be made somewhere when coming up with our solution to “everything” for £200. My first suggestion was therefore a bridge camera which tend to be “good all-rounders”. There are some very powerful options available for around £200 either used or new, with zooms in the 30x to 50x range. (Particular favorites of mine would be the Fuji Finepix HS range, with manual focus and zoom rings, like a DSLR, but there are great options out there from all of the major camera manufacturers). Nearly all of these new superzoom bridge cameras have DSLR-like controls for Aperture, Shutter Speed, ISO etc., and will come with an electronic viewfinder. However, they tend to have smaller maximum apertures and smaller sensors, so they are not as good for beautiful soft, out-of-focus backgrounds and their lenses tend to struggle at long focal lengths in difficult lighting conditions. But is there another option? Is it even possible to get a DSLR, with a set of additional lenses, to give you the versatility of a bridge camera for the same price? The equipment bought/identified does not have to be new (since the cheapest DSLRs are commonly more than £200 with a kit lens new). The final kit does not have to take up as little space as a bridge camera – but it does have to be portable, and transportable in a single bag. The final kit must be capable of taking photos of at least 10.1MP (considered the minimum for proper “photo quality” A4 / 8″ x 12″ photographic prints). The final kit must be capable of at least ISO 6400 (which is at least faster than traditional film, though not much to shout about compared to some modern Bridge cameras). The final kit must be capable of a wide-angle to super-telephoto zoom (ideally of over 30X). Evidence of the availability of the item at that price (as at September / October 2014) should be shown – no open ebay bids! The kit must be capable of macro. Apologies to any Nikon fanatics out there – but I have plumped for Canon in this test for two reasons. Second hand Canon gear tends to be a bit cheaper, and because I am a Canon user myself, I can vouch for how well the items mentioned here work. 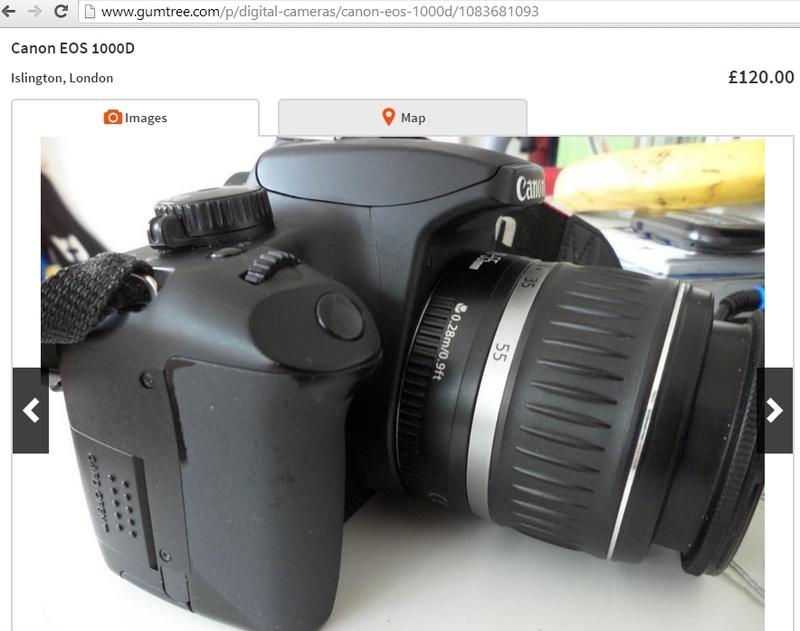 Canon EOS 400D – The evidence, listed on Gum Tree for £100 with a Mk II 18-55mm kit lens (the type with no image stabilization, but one I own and have used a lot). Canon EOS 1000D also with an 18-55mm kit lens (the first DSLR I ever owned!) – this one is £120, though I have seen them on sale for less occasionally. 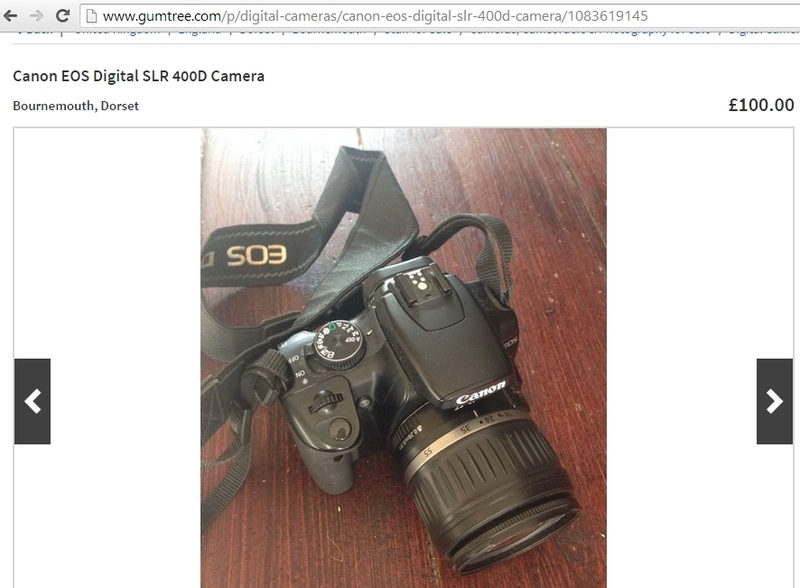 They are available for around £80 without the lens on gumtree today. Canon 18-55mm F3.5-5.6 kit lens (free with body) – a wide angle to portrait length zoom lens – which can be found from as little as £25 without Image Stabilization, if you buy the camera body separately, such as the 1000D, available for £80. 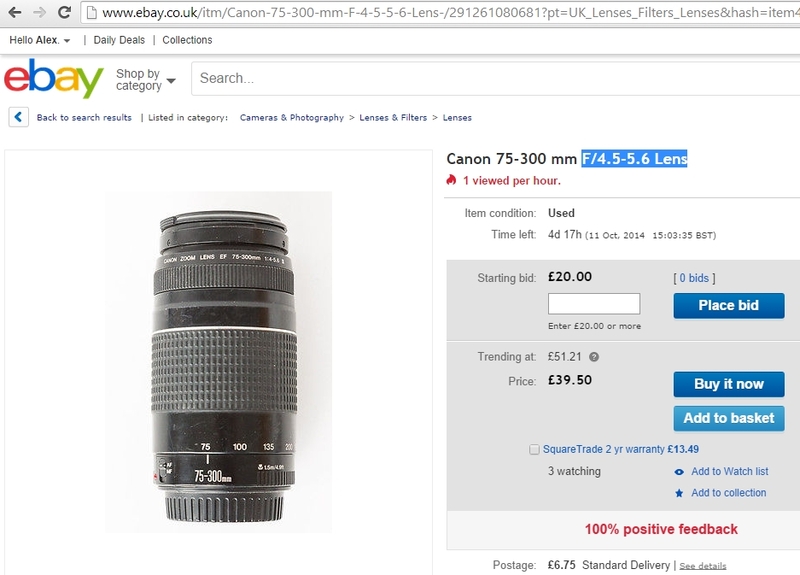 Canon 75-300 F/4.5-5.6 Lens – available for around £45 (or less if you have patience bidding on ebay). 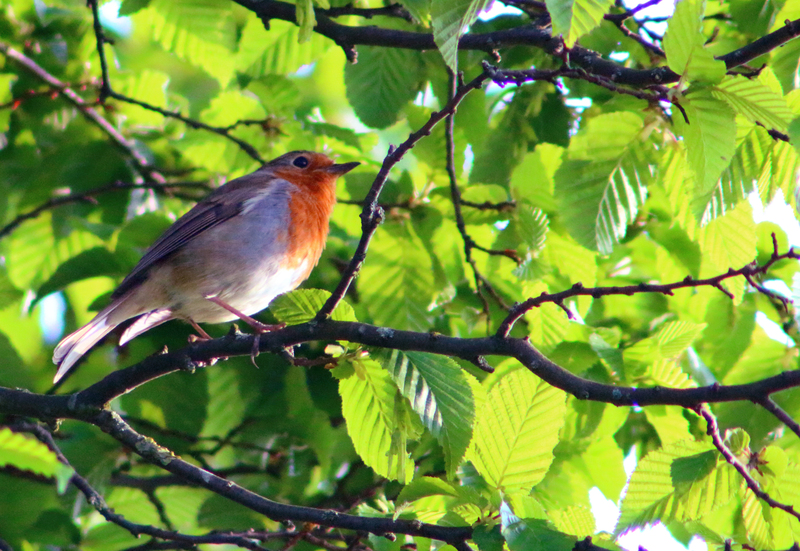 Also look out for the excellent Tamron 70-300mm lens. 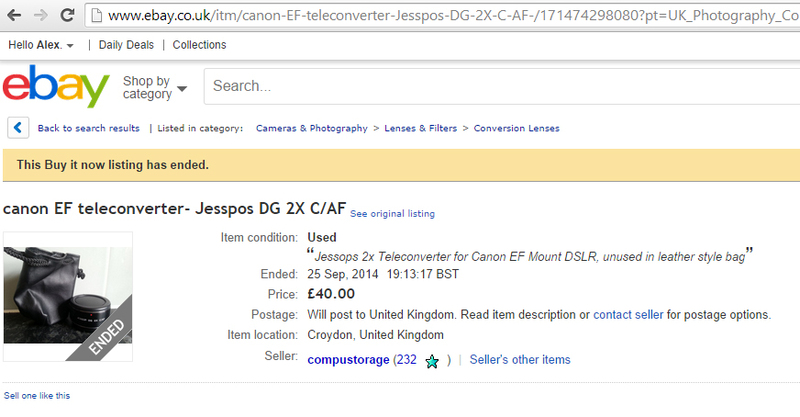 Jessops 2x teleconverter (Canon Fit) – £40 (also available from Kenko and similar brands). WARNING!! These can be very variable in price, so you will need to do a lot of searching to find a bargain! Also do not buy a screw fit, filter ring type. They do not do the same thing, and they do not work anything like as well! They’re frankly rubbish. 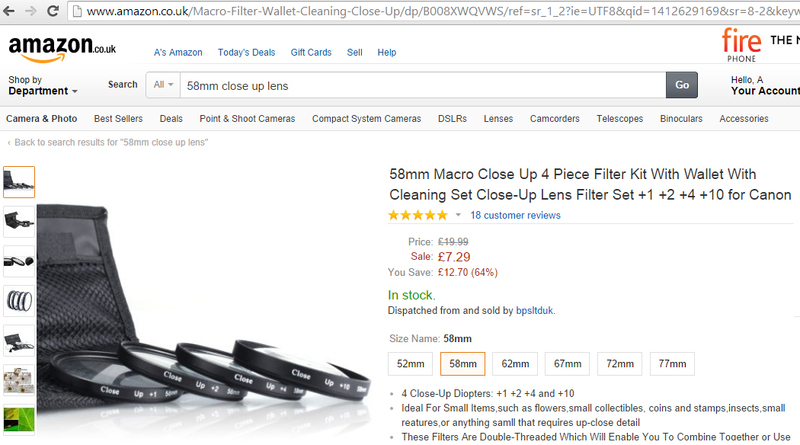 Set of 4 macro / close-up lenses – £7.50. In this case, for a 58mm filter ring size – which will therefore work with both the 18-55mm and 75-300mm Canon lenses. If you were to, instead, buy something like the Tamron 70-300mm lens, you would want a 62mm thread size and a step-up ring for the 18-55mm lens. 0.45x Wide Angle lens for use with the 18-55mm lens. The kit has a focal range of 8.1mm to 600mm (technically a 74X magnification from widest angle to longest focal length) – and a 35mm equivalent range of 13mm to 960mm focal lengths. But how much space does it take up? Does it fit in a bag? 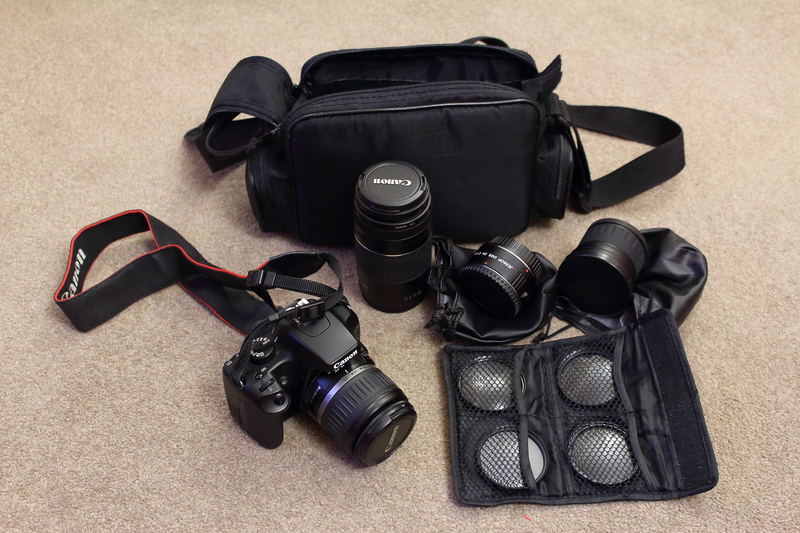 The full kit – for £195, all fits in a bag (which I got for 50p in a local charity shop). 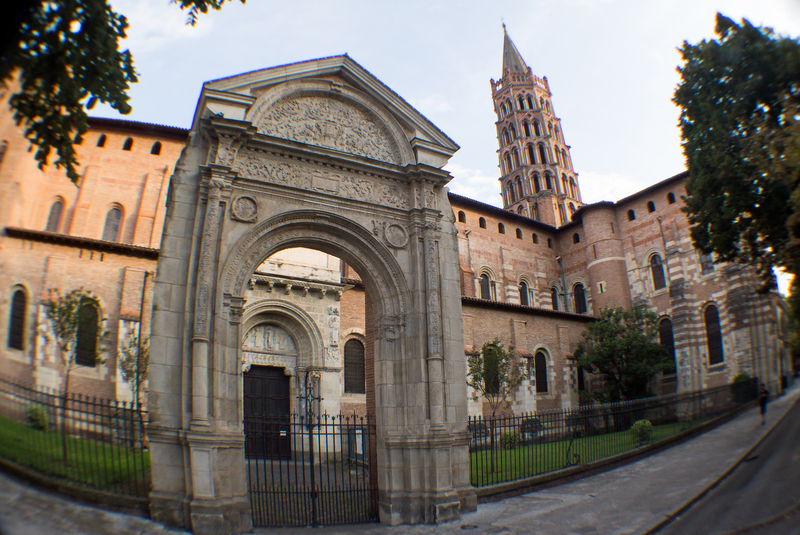 Basilique Saint-Sernin, Toulouse – which is too big and surrounded by trees to be conveniently shot without a fisheye – in this case a cheap 58mm screw-fit adapter on an 18-55mm kit lens.